Microemulsions are extensively used in advanced material and chemical processing. However, considerable amounts of surfactant are needed for their formulation, which is a drawback due to both economic and ecological reasons. 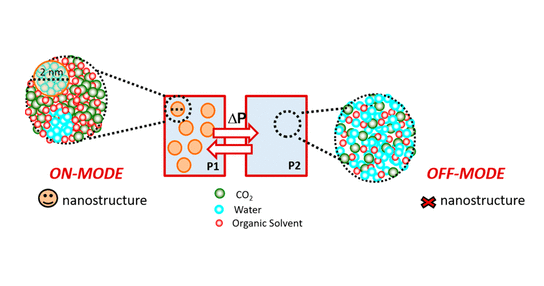 Here, we describe the nanostructuration of recently discovered surfactant-free, carbon dioxide (CO2)-based microemulsion-like systems in a water/organic-solvent/CO2 pressurized ternary mixture. “Water-rich” nanodomains embedded into a “water-depleted” matrix have been observed and characterized by the combination of Raman spectroscopy, molecular dynamics simulations, and small-angle neutron scattering. These single-phase fluids show a reversible, pressure-responsive nanostructuration; the “water-rich” nanodomains at a given pressure can be instantaneously degraded/expanded by increasing/decreasing the pressure, resulting in a reversible, rapid, and homogeneous mixing/demixing of their content. This pressure-triggered responsiveness, together with other inherent features of these fluids, such as the absence of any contaminant in the ternary mixture (e.g., surfactant), their spontaneous formation, and their solvation capability (enabling the dissolution of both hydrophobic and hydrophilic molecules), make them appealing complex fluid systems to be used in molecular material processing and in chemical engineering.